Built this sled for small peices. It will cut 25cm x 80cm (roughly 10”x32”). The stop block flips up and has an adjustable indicator for dialing in the accuracy. Put a metric/imperial measuring tape on it as I use both. The hole is for hanging it on the wall. It works great and I am glad I made it. Now need one for large items. I got some extruded aluminum with T-slots and upgraded the sled. very sharp, clean design. And I like the flip-stop. I need to make something similar. Do you feel there is any advantage/disadvantage in single groove runner. You’re always ahead on shop jigs. That’s a good thing! Looks like you used plywood for base. What hardwood for your runner? James asked a great question. I’d appreciate your thoughts. Thats a really nice jig buddy! Cant wait to see the next one for bigger cuts. James – No I don’t feel there is an advantage in using two mitre slots on a jig. Actually I have only had problems with using two as they tend to bind making it difficult to push. Get a perfect fit with the one and you won’t have any problems. If the one is a little loose then use tape on the side as a shim and all will be good. I make my mitre bar from 11mm baltic birch as it doesn’t move as much as hardwood. I have been making shop jigs for the past 18 months or so because I failed to make them over the past 25 years so finally decided to spend some time on the shop making jigs and cabinets. Almost done I hope. Sleds are a gr8 addition to a woodworkers arsenal of jigs. Very good looking CC sled, I like the design and smaller scale! I want to put together a sled like that but even smaller scale to use when doing small cutting ops at the TS. Thanks for sharing. Rob – I might put a blade guard on it in the future. 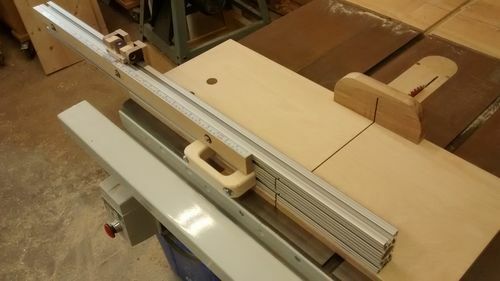 Mathias Wandel made a small sled and I like his design http://woodgears.ca/delta_saw/small_sled.html . Check it out sometime.